:: steph chows ::: I'm a sprout farmer! It's true, and seriously fun and easy! 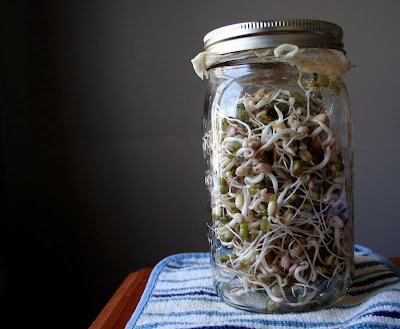 My coworker Beth recently introduced me to the art of growing your own sprouts at home. I love sprouts but they can be so expensive at the store... problem no more! I grew this big quart size mason jar full for under 25 cents! All it takes is a mason jar, a piece of cheese cloth, some seeds to sprout, and water! Easy cheesy. I had an extra wide mouth quart size mason jar laying around, and also had some cheese cloth on hand. All I needed were some seeds to get sprouting! I chose to sprout mung beans (bean sprouts) for my first try, I love the big crunchy texture and will totally be making pad thai with these! Place 3 Tbs of mung beans into the mason jar and cover with 6 Tbs water, cover top with cheese cloth and place jar ring on to hold the cloth in place. Let soak in a dark warm place overnight. In the morning drain the water (it's full of great nutrients so use it to water your indoor plants or something) then fill the jar to the top with new water let it sit 1 minute, swirl them around and drain it again. Place the mason jar in a bowl so it's tipped on it's side somewhat (jar mouth facing downward) and place back in a warm dark place (mung beans are eaten white, hence the dark place, if you are growing something like alfalfa, you keep them out in the sun so that they can turn green). Rinse them again at night and repeat each night and morning for 3-4 days. Your sprouts will be around 2 inches when they are full gown. The hulls of the seeds will fall off at some point, you can toss them out. The only thing to watch for is mold, if you keep them to moist they may grow mold (GROSS) so keep an eye out! I think I'm going to grow some alfalpha next! Let us know how the alfalfa works out! That is so cool, I definitely want to try this! I love sprouts. Wow! I didn't realize it was this easy! I've never even heard of this!! It's like in the food world, I live under a rock :) What an AWESOME, cool idea... I'm definitely trying this!!!!!!! What fun, I love sprouts! Thanks for reminding me that I should start some of my own- They're so freaking expensive at the store. Oh man... Steph - this rocks. I'm hooked on Broccoli-sprouts lately, so I'm definitely going to try this! That is so cool!! I have to do this!!! Thanks for sharing! Dude, I've been working on a mung bean sprouts post for the last two weeks trying to master the best technique. I picked them up at the co-op when I went spice shopping last time! Get out of my head!!! Pearl- let me know how it goes for you! Mia- you guys will be the first to know! Sara and Natalie- so tasty and easy! Diva- I'm still on the search for the perfect sauce but I bet these sprouts make it taste better either way! bittersweet- I knew you'd love this one :) Hope they grow well for you! NQN- I totally agree! It reminds me of elementary school and learning about growing grass and why it's green :) too fun! Aleta- LOL!!!! I picked my seeds up with all my spices at the co-op too!!! Man getting a little freaky here :) Maybe we were separated at birth! I've always meant to become a sprout farmer. What's stopping me?? I couldn't say! 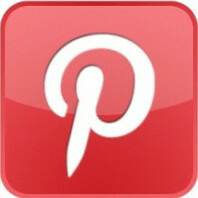 This post is bound to inspire me, though! would love to know how the alfalfa turns out. growing up in the philippines, one of the first projects we do in elementary school is to grow bean sprouts. not that we ever eat the sprouts back then. then a million years later, i lived in tonga and couldn't find fresh bean sprouts so i started "farming" them in a baking sheet with wet towel. was a pain to "harvest" but they were good! ....and fun!! Ok, so I'm a dork, but I became obsessed with sprouts last summer and bought a Go Sprout sprouter. What can I say: I'm a sucker for gadgets. I'm sure it will make an appearance on my blog at some point when salad season begins again. My mom used to grow her mung bean sprouts when I was a kid, I should probably start doing it too. thanks for sharing your experience. I really want to grow alfalfa too so I'll be looking forward to your report on that!